March 30, 2018. Text below with my bolds. After failing in every American political forum since the Paris climate accord was reached two years ago, the climate change movement has once again retreated to the courts. Not surprisingly, these advocates selected California’s federal courts as the forum of choice, counting on their comparatively liberal dispositions to breathe new life into their agenda. 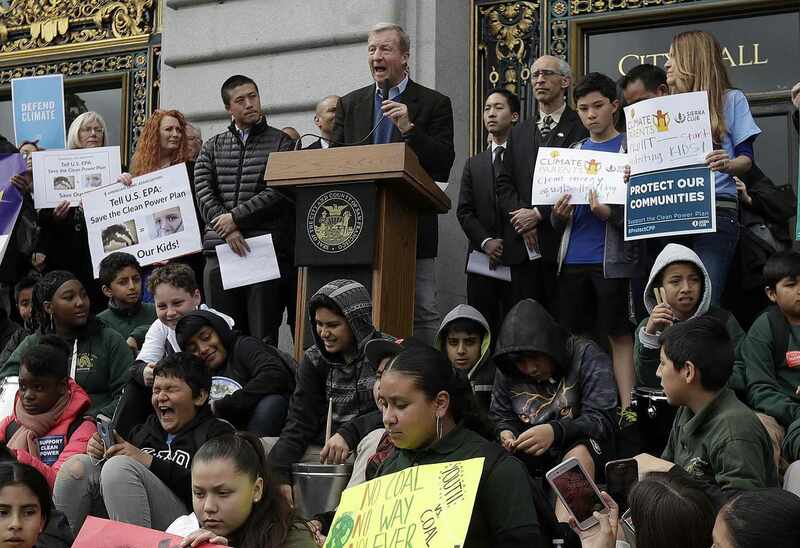 Pursuant to this initiative, several California counties and cities have sued numerous defendants, including major oil and gas companies, for emitting and exacerbating emissions of greenhouse gases. Given this history, it is especially alarming that the climate change movement now seeks legal judgments in the absence of objective standards derived from the legislative or regulatory process. Even more incredibly, this persistent excursion has already been rejected by not only the Ninth Circuit Court of Appeals – the reviewing court that will decide any appeal from these judgments – but also by the Supreme Court of the United States. Controversies such as climate change concern policy choices and value determinations that are constitutionally reserved to the executive branch or Congress and are especially ill-suited for judges. The Supreme Court has held that courts are fundamentally unequipped to formulate national polices or develop standards for matters, such as climate change, that are not legal in nature. As Justice Felix Frankfurter cautioned, “A court is likely to lose its way if it strays outside the modest bounds of its own special competency” and adjudicates only the legal phases of a broad social problem into an “opportunity for formulating judgments of social policy.” Although such “political questions” cannot be resolved constitutionally by judges, the climate movement seeks that precise result in California. Even more curiously, the movement seeks monetary judgments for the California cities’ and counties’ own pockets – judgments supposedly intended to pay for adaptation and abatement of the alleged worldwide nuisance. Such money, if awarded as damages, would comprise gigantic windfalls allocated by unelected federal judges and spent at each plaintiff’s discretion. The judgments could never be implemented in a manner reasonably calculated to reverse global warming unless they were accompanied by a bureaucracy created, elected and funded to supervise the work internationally and ensure against waste and abuse. Since neither Congress, the California legislature, the county and city governments, nor any other elected bodies are willing to serve in these roles, the plundering of America’s energy enterprises is entirely unwarranted. Under controlling Supreme Court authority, even when the political branches have not acted, common law courts are not necessarily free to “fill the void.” Irrespective of whether the executive or legislative branches have spoken, due respect for their constitutional responsibilities – combined with awareness of the judiciary’s own limitations – should motivate judicial restraint. Although the ancients concluded that “nature abhors a vacuum,” there are circumstances in the law, as here, where uncharted voids should be eschewed. In the absence of guiding principles, errors are as likely to fill the jurisprudential void as wisdom. Richard Faulk is a lawyer at Davis Wright Tremaine in Washington, D.C.
Barents Sea on the right adding ice in March 2018. Arctic ice watchers looking for holes in the ice found one in Bering Sea and raise alarms about it. Yes, the annual maximum is lower, entirely due to open water in Bering Sea, which melts out every summer anyway. Elsewhere Arctic ice is ordinary, except for Barents Sea where there seems to be an ice machine that added 238k km2 to the extent there, an increase of 46% since March 1. US Submarine breaks through ice in Beaufort Sea March 17. Since Feb. 26, two protesters have been on platforms in two trees on Peters Mountain with hopes of preventing the Mountain Valley Pipeline from moving forward. More than a dozen protesters who clambered into holes dug for a high pressure gas pipeline said they had been found not responsible by a judge after hearing them argue their actions to try and stop climate change were a legal “necessity”. Karenna Gore, the daughter of former Vice President Al Gore, was among more than 198 people who were arrested because of their 2015 actions protesting the pipeline in West Roxbury, Massachusetts, a suburb of Boston. Thirteen people were to go on trial this week, though prosecutors downgraded their original criminal charges to one of civil infraction. On Tuesday, Judge Mary Ann Driscoll of West Roxbury District Court, found all 13 defendants not responsible, the equivalent of not guilty in a criminal case. She did so after each of the defendants addressed the judge and explained why they were driven to try and halt the pipeline’s construction. A West Virginia judge has granted a temporary restraining order against pipeline protesters sitting in trees, leaving unanswered the question of how to remove them. The protesters are “temporarily restrained from impeding … access” to a section of the Jefferson National Forest where construction of a natural gas pipeline is planned, the order from Monroe County Circuit Court Judge Robert Irons states. In seeking the order, Mountain Valley Pipeline said in court papers that the “tree sit” protest could prevent it from cutting trees along the pipeline’s path in time to meet a March 31 deadline imposed by federal wildlife protections. That is just what the protesters intend. If members of the group, assisted by a network of supporters, remain perched on wooden platforms in two trees about 60 feet above the ground, law enforcement officials could be asked to get them down. Hedrick said his office has received no instructions from the judge to serve or enforce the order — leaving matters up in the air for now. The temporary restraining order, dated Thursday, is effective for 10 days. Additional details could come out Tuesday, when a hearing is scheduled on Mountain Valley’s request for a preliminary injunction, which could carry more weight and last longer. Hedrick said it’s possible that the U.S. Forest Service — essentially the landowner that granted Mountain Valley a right of way through about 3.5 miles of woods — could take the lead in enforcing the order. Forest Service officials have said only that they are monitoring the situation. Meanwhile, the loosely organized group of protesters says it has no plans to back down from stands in two trees along the ridgeline of Peters Mountain, where the pipeline would pass under the Appalachian Trail. Some points should be considered. Unlike the valve turners, the Boston protesters did not vandalize private property and equipment. Also, the pipeline was built anyway. These facts may have led to the leniency. In the West Virginia case, the main concern seems to be conserving the forest and water purity, rather than claiming to stop global warming. Still that state may be less tolerant of obstruction by greens. News outlets report Judge Robert Irons denied the injunction, reversing course less than two weeks after granting Mountain Valley Pipeline a 10-day restraining order against the protesters. Mountain Valley Pipeline had sought the order, saying the protest could prevent cutting trees along the pipeline’s path in time to meet a March 31 federal wildlife protection deadline. A licensed surveyor testified the protesters were outside of the no-cut zone and inside the company’s right of way, but the protesters’ attorney, William DePaulo, pointed out mapping inconsistencies. In his ruling, Irons highlighted concerns over the map data’s accuracy and questioned the urgency to reach a decision over two trees along the 300-mile (480-kilometer) pipeline. Speaking of leaving matters up in the air, the pipeline protesters have been in the trees for a month, which is impressive. But they are far from setting a record for moral pedestals. That honor goes to Simeon the Stylite (390-459), an ascetic saint who achieved notability for living 37 years on a small platform on top of a pillar near Aleppo, Syria. A major El Nino was the dominant climate feature in recent years. HadSST is generally regarded as the best of the global SST data sets, and so the temperature story here comes from that source, the latest version being HadSST3. More on what distinguishes HadSST3 from other SST products at the end. The chart below shows SST monthly anomalies as reported in HadSST3 starting in 2015 through February 2018. Note that higher temps in 2015 and 2016 were first of all due to a sharp rise in Tropical SST, beginning in March 2015, peaking in January 2016, and steadily declining back below its beginning level. Secondly, the Northern Hemisphere added three bumps on the shoulders of Tropical warming, with peaks in August of each year. Also, note that the global release of heat was not dramatic, due to the Southern Hemisphere offsetting the Northern one. A global cooling pattern has persisted, seen clearly in the Tropics since its peak in 2016, joined by NH and SH dropping since last August. An upward bump occurred last October, and again in January 2018. Now the cooling has resumed in February with only the NH showing a slight increase. As will be shown in the analysis below, 0.4C has been the average global anomaly since 1995 and this month remains lower at 0.349C. SH erased the January bump while the tropics reached a new low of 0.155 for this period. 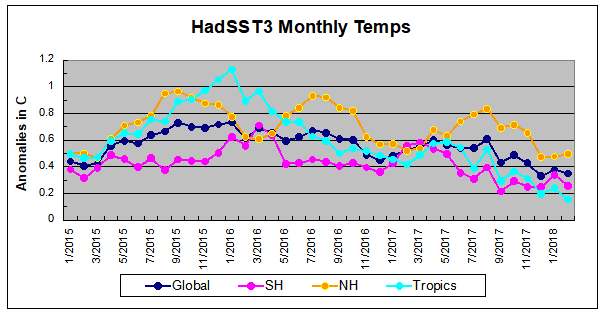 Global and NH SSTs are the lowest since 3/2014, while SH and Tropics SSTs are the lowest since 3/2012. The graph below is noisy, but the density is needed to see the seasonal patterns in the oceanic fluctuations. Previous posts focused on the rise and fall of the last El Nino starting in 2015. This post adds a longer view, encompassing the significant 1998 El Nino and since. The color schemes are retained for Global, Tropics, NH and SH anomalies. Despite the longer time frame, I have kept the monthly data (rather than yearly averages) because of interesting shifts between January and July. Open image in new tab for sharper detail. 1995 is a reasonable starting point prior to the first El Nino. The sharp Tropical rise peaking in 1998 is dominant in the record, starting Jan. ’97 to pull up SSTs uniformly before returning to the same level Jan. ’99. For the next 2 years, the Tropics stayed down, and the world’s oceans held steady around 0.2C above 1961 to 1990 average. Then comes a steady rise over two years to a lesser peak Jan. 2003, but again uniformly pulling all oceans up around 0.4C. Something changes at this point, with more hemispheric divergence than before. Over the 4 years until Jan 2007, the Tropics go through ups and downs, NH a series of ups and SH mostly downs. As a result the Global average fluctuates around that same 0.4C, which also turns out to be the average for the entire record since 1995. 2007 stands out with a sharp drop in temperatures so that Jan.08 matches the low in Jan. ’99, but starting from a lower high. The oceans all decline as well, until temps build peaking in 2010. But the peaks coming nearly every July in HadSST require a different picture. Let’s look at August, the hottest month in the North Atlantic from the Kaplan dataset. Now the regime shift appears clearly. Starting with 2003, seven times the August average has exceeded 23.6C, a level that prior to ’98 registered only once before, in 1937. And other recent years were all greater than 23.4C. The oceans are driving the warming this century. SSTs took a step up with the 1998 El Nino and have stayed there with help from the North Atlantic, and more recently the Pacific northern “Blob.” The ocean surfaces are releasing a lot of energy, warming the air, but eventually will have a cooling effect. The decline after 1937 was rapid by comparison, so one wonders: How long can the oceans keep this up? HadSST3 is distinguished from other SST products because HadCRU (Hadley Climatic Research Unit) does not engage in SST interpolation, i.e. infilling estimated anomalies into grid cells lacking sufficient sampling in a given month. From reading the documentation and from queries to Met Office, this is their procedure. HadSST3 imports data from gridcells containing ocean, excluding land cells. From past records, they have calculated daily and monthly average readings for each grid cell for the period 1961 to 1990. Those temperatures form the baseline from which anomalies are calculated. In a given month, each gridcell with sufficient sampling is averaged for the month and then the baseline value for that cell and that month is subtracted, resulting in the monthly anomaly for that cell. All cells with monthly anomalies are averaged to produce global, hemispheric and tropical anomalies for the month, based on the cells in those locations. For example, Tropics averages include ocean grid cells lying between latitudes 20N and 20S. Gridcells lacking sufficient sampling that month are left out of the averaging, and the uncertainty from such missing data is estimated. IMO that is more reasonable than inventing data to infill. And it seems that the Global Drifter Array displayed in the top image is providing more uniform coverage of the oceans than in the past. Sea Level Change in the Fifth Assessment Report includes detailed explanation of the changes in the global mean sea level, regional sea level, sea level extremes, and waves (Church et al., 2013). Anthropogenic greenhouse gas emissions are causing sea-level rise (SLR) (Church and White, 2006; Jevrejeva et al., 2009). It is also claimed that ocean thermal expansion and glacier melting have been the dominant contributors to 20th century global mean sea level rise. It is further opined that global warming is the main contributor to the rise in global sea level since the Industrial Revolution (Church and White, 2006). According to Cazenave and Llovel (2010) rising of air temperature can warm and expand ocean waters wherein thermal expansion was the main driver of global sea level rise for 75 to 100 years after the start of the Industrial Revolution. However, the share of thermal expansion in global sea level rise has declined in recent decades as the shrinking of land ice has accelerated (Lombard et al 2005). Lombard et al. (2006) opined that recent investigations based on new ocean temperature data sets indicate that thermal expansion only explains part (about 0.4 mm/yr) of the 1.8 mm/yr observed sea level rise of the past few decades. However, observation claim of 1.8 mm/yr sea level rise is also limited in scope and accuracy. Mean Sea Level (MSL) is defined as the zero elevation for a local area. The zero surface referenced by elevation is called a vertical datum. Since sea surface conforms to the earth’s gravitational field, MSL has also slight hills and valleys that are similar to the land surface but much smoother. The MSL surface is in a state of gravitational equilibrium. It can be regarded as extending under the continents and is a close approximation of geoid. By definition geoid describes the irregular shape of the earth and is the true zero surface for measuring elevations. Because geoid surface cannot directly be observed, heights above or below the geoid surface can’t be directly measured and are inferred by making gravity measurements and modeling the surface mathematically. Previously, there was no way to accurately measure geoid so it was roughly approximated by MSL. Although for practical purposes geoid and MSL surfaces are assumed to be essentially the same, but in reality geoid differs from MSL by several meters. Geoid moves above MSL where mass is excess and moves below MSL where mass is deficient. Distribution of mass in the crust in terms of ‘excess’ and ‘deficient’ can cause volume expansion and contraction for relative sea-level change. Height of the ocean surface at any given location, or sea level, is measured either with respect to the surface of the solid Earth i.e., relative sea level (RSL) or a eustatic sea level (ESL) (Fig. 1A). Relative sea level (RSL) change can differ significantly from global mean sea level (GMSL) because of spatial variability in changes of the sea surface and ocean floor height. RSL change over the ocean surface area gives the change in ocean water volume, which is directly related to the sea level change. Sea level changes can be driven either by variations in the masses or volume of the oceans, or by changes of the land with respect to the sea surface. In the first case, a sea level change is defined ‘eustatic’; otherwise, it is defined ‘relative’ (Rovere et al., 2016). According to Kemp et al. (2015) land uplift or subsidence can result in, respectively, a fall or rise in sea level that cannot be considered eustatic as the volume or mass of water does not change. Any sea level change that is observed with respect to a land-based reference frame is defined a relative sea level (RSL) change. Eustatic Sea Level (ESL) changes also occur when the volume of the ocean basins changes due to tectonic seafloor spreading or sedimentation. Figure 1. (A) Definition of sea level i.e., eustatic sea level and relative sea level (B) Different types of sea level observation techniques: satellite altimetry (based on NASA educational material), tide gauge and paleo sea level indicators (see text for details). Modern tide gauges are associated with a GPS station that records land movements. Changes in sea level can be observed at very different time scales and with different techniques (Fig. 1B). Regardless of the technique used, no observation allows to record purely eustatic sea level changes. At multi-decadal time scales, sea level reconstructions are based on satellite altimetry/gravimetry and landbased tide gauges (Cabanes et al., 2001). At longer time scales (few hundreds, thousands to millions of years), the measurement of sea level changes relies on a wide range of sea level indicators (Shennan and Horton, 2002; Vacchi et al., 2016; Rovere et al., 2016a). One of the most common methods to observe sea level changes at multi-decadal time scales is tide gauges. Modern tide gauges are associated with a GPS station that records land movements (Fig. 1B). However, tide gauges have three main disadvantages: (i) they are unevenly distributed around the world (Julia Pfeffer and Allemand, 2015); (ii) the sea level signal they record is often characterized by missing data (Hay et al., 2015); and (iii) accounting for ocean dynamic changes and land movements might prove difficult in the absence of independent datasets (Rovere et al., 2016). Since 1992, tide gauge data are complemented by satellite altimetry datasets (Cazenave et al., 2002). The altitude of the satellite is established with respect to an ellipsoid, which is an arbitrary and fixed surface that approximates the shape of the Earth. The difference between the altitude of the satellite and the range is defined as the sea surface height (SSH) (Fig. 1B). Subtracting from the measured SSH a reference mean sea surface (e.g. the geoid), one can obtain a ‘SSH anomaly’. The global average of all SSH anomalies can be plotted over time to define the global mean sea level change, which can be considered as the eustatic, globally averaged sea level change. The shape of the geoid is crucial for deriving accurate measurements of seasonal sea level variations (Chambers, 2006). According to Rovere et al. (2016) measurements of paleo eustatic sea level (ESL) changes bear considerable uncertainty. Further, sea level changes on Earth cannot be treated as a rigid container although eustasy is defined in view of Earth as a rigid container. In reality, internal and external processes of the earth such as tectonics, dynamic topography, sediment compaction and melting ice all trigger variations of the container and these ultimately affect any sea level observation. An estimated, observed, and possible future amounts of global sea level rise from 1800 to 2100, relative to the year 2000 has been proposed by Melillo et al. (2014) based on the works of Church and White (2011), Kemp et al. (2011) and Parris et al. (2012) (Fig. 2). The main concern of the predicted future global sea level rise shown in Melillo et al. (2014) is the forecast beyond 2012 up to 2100. Although sea level rise is shown by 0.89 ft in 209 years (between 1800 and 2009) at the rate of 0.0043 ft/yr, the prediction of 4–6 ft at the rate of 0.044 ft/yr and 0.066 ft/yr respectively in 91 years between 2009 and 2100) is highly questionable. An abrupt jump in the sea level rise after 2009 is definitely a conjecture. Figure 2. Estimated, observed, and predicted global sea level rise from 1800 to 2100. Estimates from proxy data are shown in red between 1800 and 1890, pink band shows uncertainty. Tide gauge data is shown in blue for 1880–2009. Satellite observations are shown in green from 1993 to 2012. The future scenarios range from 0.66 ft to 6.6 ft in 2100 (Redrawn from Melillo et al., 2014). This study is based on the geophysical aspects of the earth wherein shape of the earth is the fundamental component of global sea level distribution. The physical surface of the earth adjusted to the mathematical surface of the earth is spheroidal. This spheroidal surface always coincides with the global mean sea level (Fig. 3). Having relationship between the shape of the earth and the global sea level, gravitational attraction of the earth plays a dominant role against sea level rise. Gravity is a force that causes earth to form the shape of a sphere by pulling the mass of the earth close to the center of gravity i.e., each mass-particle is attracted perpendicular towards the center of gravity of the earth (Fig. 4A). Figure 3. Physical surface (light green undulating line) of the earth adjusted to spheroidal surface (yellow broken line) by removing mass from continent above mean sea level and filling same mass in ocean below mean sea level. Geoid surface (light blue solid line), on the other hand, depends on the internal mass distribution i.e., geoid moves below spheroid where mass is deficient and it moves above spheroid where mass is excess. Where geoid surface and spheroidal surface coincides is accounted for mass balanced. By definition geoid describes the irregular shape of the earth and is the true zero surface for measuring elevations. Because geoid surface cannot be directly observed, heights above or below the geoid surface can’t be directly measured and are inferred by making gravity measurements and modeling the surface mathematically. MSL surfaces are assumed to be essentially the same, at some spots the geoid can actually differ from MSL by several meters. The sphere-like shape of the earth is distorted by (i) greater gravity attraction of the polar region causing polar flattening and lesser gravity attraction of the equatorial region causing equatorial bulging, and (ii) the centrifugal force of its rotation. This force causes the mass of the earth to move away from the center of gravity, which is located at the equator. Ocean-fluid surface takes a outward normal vector due to centrifugal force which is maximum at the equator and zero at the poles (Fig. 4B). Mathematical surface, an imaginary surface coinciding with the mean sea level of the Earth is a spheroidal surface due to its spin, and it is the centrifugal force due to the Earth’s spin caused polar flattening and equatorial bulge. The polar flattening ratio (eccentricity) of 1/298 implied that sea level at the equator is about 21 km further from the center of the Earth than it is at the poles. Water would find its hydrostatic level which is curvilinear, and this level is influenced by the gravity as well as centrifugal force. Centrifugal force acts as much on the oceans as it does on the solid Earth, which is maximum at the equator and minimum at the pole (Fig. 4B). Any addition of water to the oceans is supposed to flow uphill towards equator from the poles causing sea level rise everywhere, but it does not. Hence, although ocean water at the equator makes a level difference of 21 km higher than at the poles, it is the centrifugal force maximum at the equator and zero at the poles would prevent ocean water-column from moving down-hill toward poles effectively restricting sea level rise at the higher latitudes. On the other hand high gravity attraction and zero centrifugal force at the poles and low gravity attraction and maximum centrifugal force at the equator effectively balance sea-level and restrict sea-level rise. While, equatorial ocean-fluid surface always attains relatively higher altitude than that of polar ocean-fluid surface, ocean water column from polar region would not move towards equatorial region. Figure 4. The shape of a sphere by pulling the mass of the earth close to the center of gravity. Blue arrows point from Earth’s surface toward its center. Their lengths represent local gravitational field strength. Gravity is strongest at the poles because they are closest to the center of mass. This difference is enhanced by the increasing density toward the center. Red arrows show the direction and magnitude of the centrifugal effect. On the equator, it is large and straight up. Near the poles, it is small and nearly horizontal. Vector addition of the blue and red arrows gives the net result of gravity plus centrifugal effect. This is shown by the green arrows. Rotation of the earth produces more centrifugal force at the equator, less as latitude increases, and zero at pole. A mass of fluid under the rotation assumes a form such that its external form is an equipotential of its own attraction and the potential of the centripetal acceleration. Above analogy reveals that even if entire polar-ice melts due to the global warming, the melt-water will not flow towards equatorial region where surface has an upward gradient and gravity attraction is also significantly low in comparison to the polar region. However, conditions at both the poles are different. Arctic Ocean in the north is surrounded by the land mass thus can restrict the movement of the floating ice, while, Antarctic in the south is surrounded by open ocean thus floating ice can freely move to the north. But this movement is likely to be limited maximum up to 60°S latitude where spheroidal surface has the maximum curvature (Fig. 6B). As usual, water can not flow from higher gravity attraction to lower gravity attraction rather it is other way around wherein higher gravity attraction of the poles would attract water from moving towards equatorial region and water column would be static at every ‘gz’ direction. Further, greater horizontal gravity gradient toward poles would also help melt-water to remain attracted toward polar region. Figure 6. (A) Surface of the earth is defined in terms of gravity values at all surface points known as the reference spheroid. It is related to the mean sea-level (MSL) surface with excess land masses removed and ocean deeps filled. Thus it is an equipotential surface, that is, the force of gravity (gz) (red arrows) is everywhere normal to this surface, or the plumb line is vertical at all points directed to the center of the earth having maximum at the poles and minimum at the equator. Two components work against sea level rise i.e., greater gravity attraction of the polar region and the equatorial bulge (B) Maximum curvature of the spheroidal surface of the Earth coincides with 60oN latitude. Floating ice from Antarctica surrounded by open ocean can freely move to the north likely to be limited maximum upto 60oS latitude where spheroidal surface has the maximum curvature. A geoid surface thus prepared exhibits bulges and hollows of the order of hundreds of kilometers in diameter and up to hundred meter in elevation occurring in the zone mostly between 60°N and 60°S latitudes. Marked changes in the contour pattern of the geoid height in the zone between 60°N and 60°S suggests maximum curvature along 60°N and 60°S. Hence any change of the global sea level due to the predicted ice melt would not extend beyond 60°N and 60°S. However the reality is that no sea-level rise actually would occur due to ice melt as a result of same volumetric replacement between melt-water and floating ice. Lindsay and Schweiger (2015) provide a longer-term view of ice thickness, compiling a variety of subsurface, aircraft, and satellite observations. They found that ice thickness over the central Arctic Ocean has declined from an average of 3.59 m (11.78 ft) to only 1.25 m (4.10 ft), a reduction of 65% over the period 1975 to 2012. Map shows sea ice thickness in meters in the Arctic Ocean from March 29, 2015 to April 25, 2015 (Fig. 9B). Total volume of ice-melt water of more than 2,500,000 km3 has been added to ocean water over an area more than 14,500,000 km2 of the central Arctic Ocean (Fig. 9B blue shaded area). By now this additional water should have caused sea level rise more than 178 mm which is much greater than what has been projected and predicted. However there is no record of such sea level rise. Arctic sea-ice has already reduced its volume due to melting from 33,000 km3 in 1979 to 16,000 km3 in 2016 without showing any sea level rise. Although Arctic sea-ice has reduced its volume, Antarctic has gained (Zhang and Rothrock, 2003) (http://psc.apl.uw.edu). In contrast to the melting of the Arctic sea-ice, sea-ice around Antarctica was expanding as of 2013 (Bintanja et al., 2013). NASA study shows an increase in Antarctic snow accumulation that began 10,000 years ago is currently adding enough ice to the continent to outweigh the increased losses from its thinning glaciers. From the above statement it is clearly understood that about 23,000 km3 sea-ice of Antarctica can freely float northward into the warmer water where it eventually melts every year without showing any sea level rise in the lower latitudes. Further, melting of such a huge volume of floating sea-ice of Antarctica not only can reoccupy volume of the displaced water but also can cool ocean-water in the lower latitudes of the southern oceans thus can prevent sea level rise due to thermal expansion of the ocean water. According to Zhang (2007) thermal expansion in the lower latitude is unlikely because of the reduced salt rejection and upper-ocean density and the enhanced thermohaline stratification tend to suppress convective overturning, leading to a decrease in the upward ocean heat transport and the ocean heat flux available to melt sea ice. The ice melting from ocean heat flux decreases faster than the ice growth does in the weakly stratified Southern Ocean, leading to an increase in the net ice production and hence an increase in ice mass. Both the polar regions exhibit reduction in ice-load in the crust due to melting and removal of ice-cover from the continental blocks every year. Reduction of such weight in the continent thus can cause isostasy to come into play and land start to uplift due to elastic rebound to maintain its isostatic equilibrium which is load-dependent and would prevent sea level rise. Figure 13. (A) Layered beach at Bathurst Inlet, Nunavut signifying post-glacial isostatic rebound (B) Some of the most dramatic uplift is found in Iceland. Evidence of isostatic rebound (C) Massive coral (Pavona clavus) exposed in 1954 by tectonic uplift in the Galapagos Islands, Ecuador (D) Beach ridges on the coast of Novaya Zemlya in arctic Russia, an example of Holocene glacio-isostatic rebound (E) A beach in Juneau, Alaska where sea level is not rising, but dropping due to glacial isostatic adjustment (F) Boat-houses in Scandinavia now considerably farther away from the water’s edge where they were built demonstrates land uplift (G) An 8000-year old-well off the coast of Israel now submerged, which is a land mark of crustal subsidence (H) The “City beneath the Sea”; Port Alexandria on the Nile delta and the drowned well off the coast of Israe (panel (G), both subsided due to subduction-pull of the downgoing African crustal slab as it enters trench. Postglacial rebound continues today albeit very slowly wherein the land beneath the former ice sheets around Hudson Bay and central Scandinavia, is still rising by over a centimetre a year, while those regions which had bulged upwards around the ice sheet are subsiding such as the Baltic states and much of the eastern seaboard of North America. Snay et al. (2016) have found large residual vertical velocities, some with values exceeding 30 mm/yr, in southeastern Alaska. The uplift occurring here is due to present-day melting of glaciers and ice fields formed during the Little Ice Age glacial advance that occurred between 1550 A.D. and 1850 A.D. When the land area shrinks globally, this corresponds to a global rise in sea level. From the curve it is certain that sea level has changed in geologic time scale due to geologic events. Hence, polar ice-melting would not contribute to sea-level rise rather sea-level would drop around the Arctic region as long as isostatic rebound will continue. Claim and prediction of 3 mm/yr rise of sea-level due to global warming and polar ice-melt is definitely a conjecture. Prediction of 4–6.6 ft sea level rise in the next 91 years between 2009 and 2100 is highly erroneous. Figure 12. Vail and Hallam curves of global paleo sea level fluctuations from the last 542 million years (Copied and redrawn from https://en.wikipedia.org/wiki/Sea-level_curve). A negative sea level trend implied that Alaska is being uplifted continuously and corresponding sea level is dropping. However, permanent uplift and corresponding sea level drop of Alaska will occur through ultimate fault rupture between land and sea. Until that time it will continue to show the pattern of sea level as of Fig. 14A. Geophysical shape of the earth is the fundamental component of the global sea level distribution. Global warming and ice-melt, although a reality, would not contribute to sea-level rise. Gravitational attraction of the earth plays a dominant role against sea level rise. As a result of low gravity attraction in the region of equatorial bulge and high gravity attraction in the region of polar flattening, melt-water would not move from polar region to equatorial region. Further, melt-water of the floating ice-sheets will reoccupy same volume of the displaced water by floating ice-sheets causing no sea-level rise. 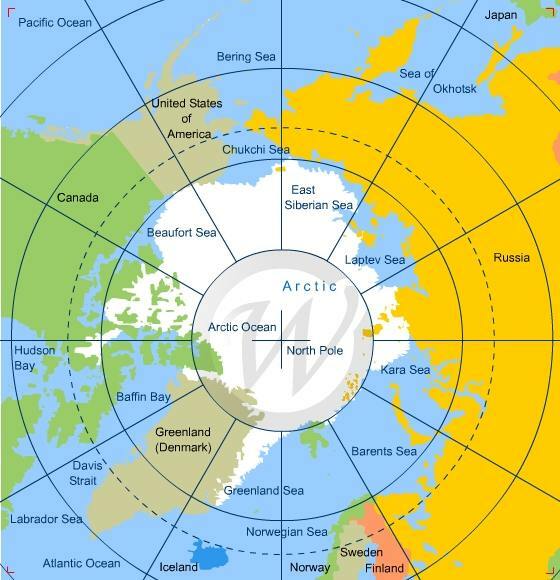 Arctic Ocean in the north is surrounded by the land mass thus can restrict the movement of the floating ice, while, Antarctic in the south is surrounded by open ocean thus floating ice can freely move to the north. Melting of huge volume of floating sea-ice around Antarctica not only can reoccupy volume of the displaced water but also can cool ocean-water in the region of equatorial bulge thus can prevent thermal expansion of the ocean water. Melting of land ice in both the polar region can substantially reduce load on the crust allowing crust to rebound elastically for isostatic balancing through uplift causing sea level to drop relatively. Palaeo-sea level rise and fall in macro-scale are related to marine transgression and regression in addition to other geologic events like converging and diverging plate tectonics, orogenic uplift of the collision margin, basin subsidence of the extensional crust, volcanic activities in the oceanic region, prograding delta buildup, ocean floor height change and sub-marine mass avalanche. This research paper reads like a tutorial on sea level rise, and explains the geoscience behind fluctuations in observed sea levels over all time scales. It should be required reading for Judge Alsup, lawyers and litigants in these multiple lawsuits. This informative post comes from Hannah Christensen Six clouds you should know about – and what they can reveal about the weather March 23, 2018 at phys.org. Text and images from the article. You don’t need a supercomputer to predict how the weather above your head is likely to change over the next few hours – this has been known across cultures for millennia. By keeping an eye on the skies above you, and knowing a little about how clouds form, you can predict whether rain is on the way. And moreover, a little understanding of the physics behind cloud formation highlights the complexity of the atmosphere, and sheds some light on why predicting the weather beyond a few days is such a challenging problem. So here are six clouds to keep an eye out for, and how they can help you understand the weather. 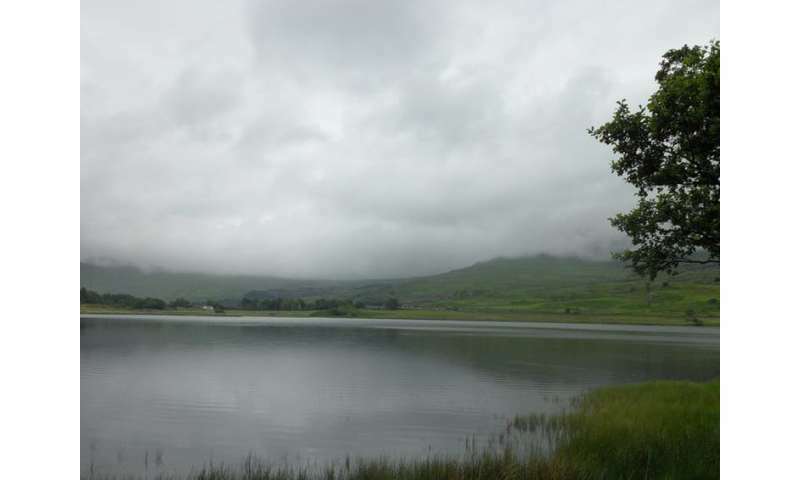 Clouds form when air cools to the dew point, the temperature at which the air can no longer hold all its water vapour. At this temperature, water vapour condenses to form droplets of liquid water, which we observe as a cloud. For this process to happen, we require air to be forced to rise in the atmosphere, or for moist air to come into contact with a cold surface. On a sunny day, the sun’s radiation heats the land, which in turn heats the air just above it. This warmed air rises by convection and forms Cumulus. These “fair weather” clouds look like cotton wool. If you look at a sky filled with cumulus, you may notice they have flat bases, which all lie at the same level. At this height, air from ground level has cooled to the dew point. 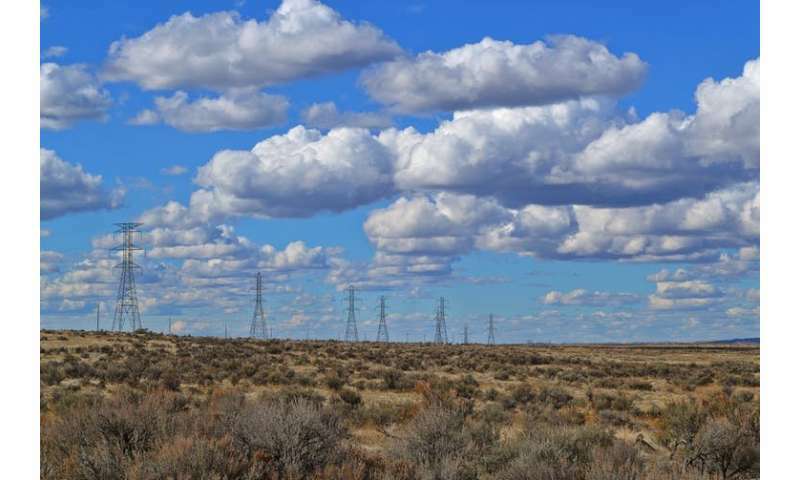 Cumulus clouds do not generally rain – you’re in for fine weather. While small Cumulus do not rain, if you notice Cumulus getting larger and extending higher into the atmosphere, it’s a sign that intense rain is on the way. This is common in the summer, with morning Cumulus developing into deep Cumulonimbus (thunderstorm) clouds in the afternoon. Near the ground, Cumulonimbus are well defined, but higher up they start to look wispy at the edges. This transition indicates that the cloud is no longer made of water droplets, but ice crystals. When gusts of wind blow water droplets outside the cloud, they rapidly evaporate in the drier environment, giving water clouds a very sharp edge. On the other hand, ice crystals carried outside the cloud do not quickly evaporate, giving a wispy appearance. 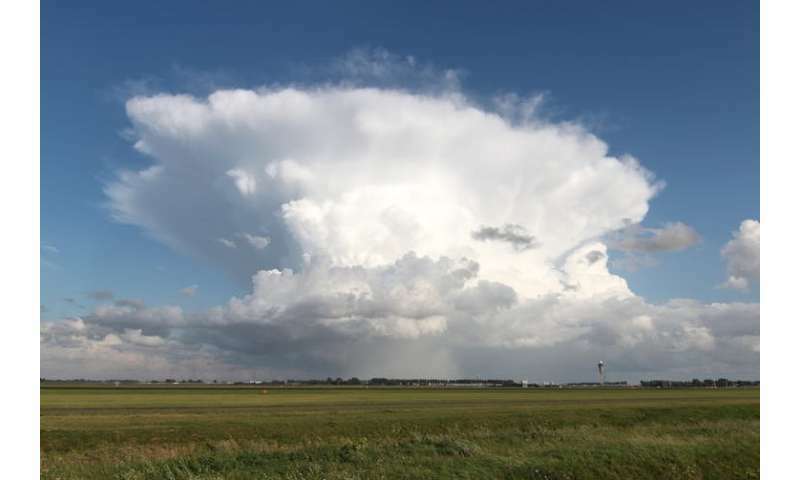 Cumulonimbus are often flat-topped. Within the Cumulonimbus, warm air rises by convection. In doing so, it gradually cools until it is the same temperature as the surrounding atmosphere. At this level, the air is no longer buoyant so cannot rise further. Instead it spreads out, forming a characteristic anvil shape. Cirrus form very high in the atmosphere. They are wispy, being composed entirely of ice crystals falling through the atmosphere. 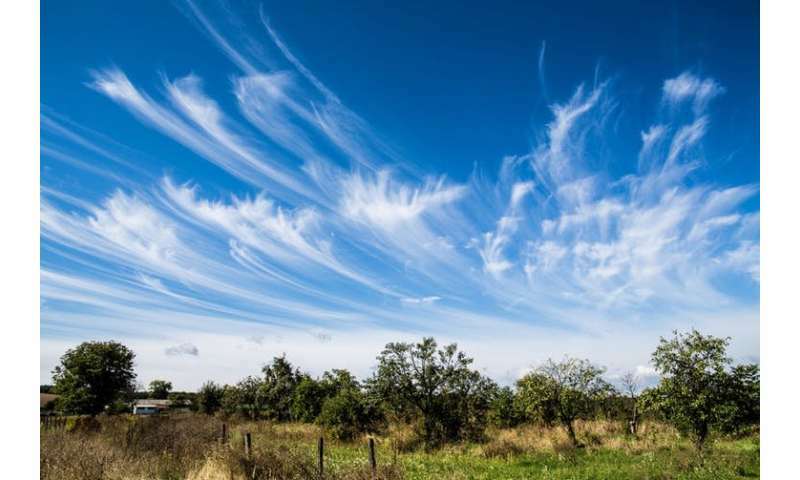 If Cirrus are carried horizontally by winds moving at different speeds, they take a characteristic hooked shape. Only at very high altitudes or latitudes do Cirrus produce rain at ground level. But if you notice that Cirrus begins to cover more of the sky, and gets lower and thicker, this is a good indication that a warm front is approaching. In a warm front, a warm and a cold air mass meet. The lighter warm air is forced to rise over the cold air mass, leading to cloud formation. The lowering clouds indicate that the front is drawing near, giving a period of rain in the next 12 hours. Stratus is a low continuous cloud sheet covering the sky. Stratus forms by gently rising air, or by a mild wind bringing moist air over a cold land or sea surface. Stratus cloud is thin, so while conditions may feel gloomy, rain is unlikely, and at most will be a light drizzle. Stratus is identical to fog, so if you’ve ever been walking in the mountains on a foggy day, you’ve been walking in the clouds. Our final two cloud types will not help you predict the coming weather, but they do give a glimpse of the extraordinarily complicated motions of the atmosphere. 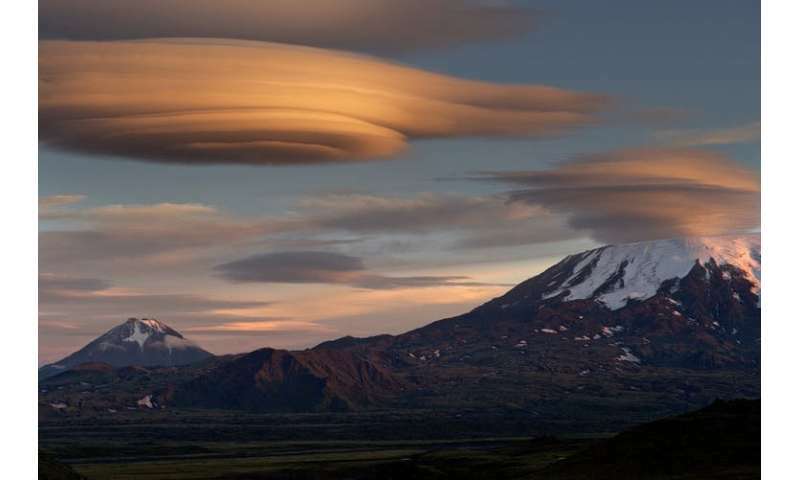 Smooth, lens-shaped Lenticular clouds form as air is blown up and over a mountain range. Once past the mountain, the air sinks back to its previous level. As it sinks, it warms and the cloud evaporates. But it can overshoot, in which case the air mass bobs back up allowing another Lenticular cloud to form. This can lead to a string of clouds, extending some way beyond the mountain range. The interaction of wind with mountains and other surface features is one of the many details that have to be represented in computer simulators to get accurate predictions of the weather. And lastly, my personal favourite. 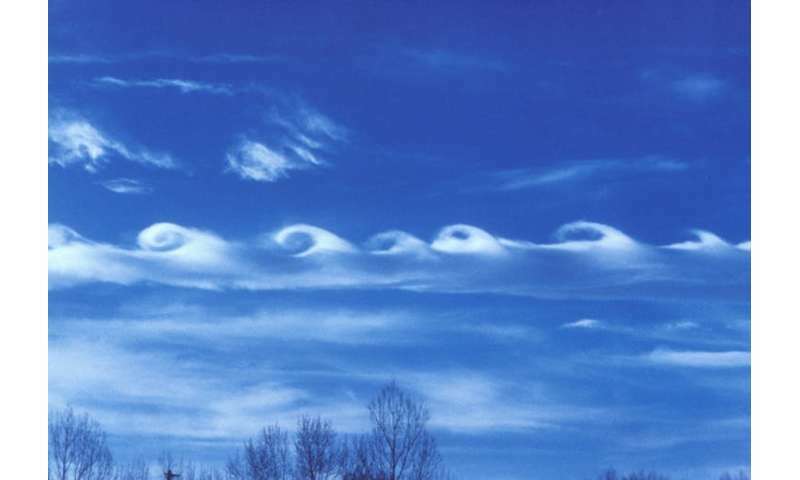 The Kelvin-Helmholtzcloud resembles a breaking ocean wave. When air masses at different heights move horizontally with different speeds, the situation becomes unstable. The boundary between the air masses begins to ripple, eventually forming larger waves. Kelvin-Helmholtz clouds are rare – the only time I spotted one was over Jutland, western Denmark – because we can only see this process taking place in the atmosphere if the lower air mass contains a cloud. The cloud can then trace out the breaking waves, revealing the intricacy of the otherwise invisible motions above our heads. I just found out, thanks to Francis Menton, that a third skeptical brief was submitted to Judge Alsup in reference to his tutorial. The thrust apparently is to show that the temperature record does not support the claim that recent variability is anything out of the ordinary. The article by Francis Menton is Klimate Kraziness: A California Judge Holds A “Tutorial” On Climate Science posted at Manhatton Contrarian. The third friend of the court brief was by The Concerned Household Electricity Consumers Council, which presented work of many scientists, most notably James Wallace III, Joseph D’Aleo, John Christie, and Craig Idso. Menton’s explanation below from his article. The conclusion of the work is that each of EPA’s “lines of evidence” has been invalidated by the best empirical evidence, and therefore the attribution of any observed climate change, including global warming, to rising atmospheric CO2 concentrations has not been established. The post The Climate Story (Illustrated) provides a set of graphics making the same argument: The temperature record does not support climate alarm. After a slow beginning this month, Arctic ice advanced to set a late annual maximum, and is now holding on to its gains the last four days. The image above shows the last week, setting new 2018 maximums on day 74 for NH overall, as well in Barents Sea. 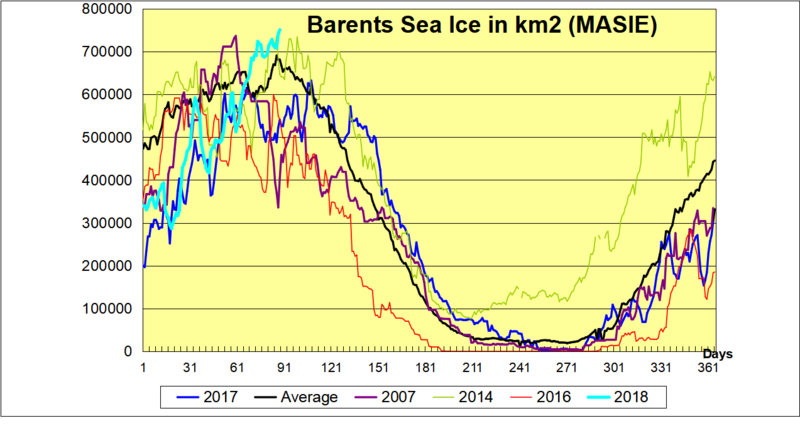 The graph below shows that as of yesterday, Barents is well above the 11 year average, and matching 2014 the highest year in the decade. The graph below shows how the Arctic extent has grown compared to the 11 year average and to some years of interest. Note the average max on day 62 and 2018 max on day 74, now matching 2007 and 380k km2 above last year. SII (NOAA) continues to show ~200k km2 less extent. Drift ice in Okhotsk Sea at sunrise. The table below shows ice extents in the regions compared to averages and last year. 11 year averages are from 2007 to 2017 inclusive. Note the overall NH shortfall is 2.5% and less than the deficit in Bering Sea. Both Okhotsk and Barents Sea are well above average, more than offsetting less extent in Greenland Sea and Baffin Bay. The picture is consistent with an ice pack of higher volume than recent years, with the melting showing at the margins. Thanks to an article at Wired, we get a first glimpse into what transpired at the March 21 courtroom tutorial called by Federal District court Judge Alsup. From a science perspective, it looks at the moment like a missed opportunity. The oil company lawyers sat in silence, allowing Chevron’s lead attorney to speak for them, and he mainly quoted from IPCC documents. The calculation seems to be taking a position that we didn’t know more and not any sooner than the IPCC came to conclusions in their series of assessment reports. The plaintiffs let alarmist scientists present on their behalf, and can now claim their opinions were not refuted. The Wired article is In the Courtroom, Climate Science Needs Substance–and Style Excerpts below with my bolds. Outside the usual procedural kabuki of the courtroom, the truth is no one really knew what to expect from this court-ordered “tutorial.” For a culture based in large measure on precedent, putting counsel and experts in a room to hash out climate change for a trial—putting everyone on the record, in federal court, on what is and is not true about climate science—was literally unprecedented. What Alsup got might not have been a full on PowerPoint-powered preview of the trial. But it did reveal a lot about the styles and conflicts inherent in the people who produce the carbon and the people who study it. Still, over the course of the morning, Boutrous nevertheless tried to neg the IPCC in two specific ways. One was a classic: He challenged the models that climate scientists use to attempt to predict the future. These computer models, Boutrous said, are “increasingly complex. That can make the modeling more powerful.” But with great power comes great potential wrongness. “Because it’s an attempt to represent things in the real world, the complexity can bring more risk.” He assured the court that Chevron agreed with the IPCC approach—posting up a slide pulled from an IPCC report that showed the multicolored paths of literally hundreds of models, using different emissions scenarios and essentially describing the best case and worst case (and a bunch of in-between cases). It looked like a blast of fireworks emerging from observed average temperature, headed chaotically up and to the right. If that seems a little bit like the “guns don’t kill people; people kill people” of petrochemical capitalism, well, Judge Alsup did start the morning by saying today was a day for science, not politics. So what knives did the representatives of the state of California bring to this oil-fight? Here’s where style is interesting. California didn’t front lawyers. For the science tutorial, the municipalities fronted scientists—people who’d been first authors on chapters in the IPCC reports from which Boutrous quoted, and one who’d written a more recent US report and a study of sea level rise in California. They knew their stuff and could answer all of Judge Alsup’s questions … but their presentations were more like science conference fodder than well-designed rhetoric. For example, Myles Allen, leader of the Climate Research Program at the University of Oxford, gave a detailed, densely-illustrated talk on the history and science of climate change…but he also ended up in an extended back and forth with Alsup about whether Svante Arrhenius’ 1896 paper hypothesizing that carbon dioxide in Earth’s atmosphere warmed the planet explicitly used the world “logarithmic.” Donald Wuebbles, an atmospheric scientist at the University of Illinois and co-author of the Nobel Prize-winning 2007 IPCC report, mounted a grim litany of all the effects scientists can see, today, of climate, but Alsup caught him up asking for specific things he disagreed with Boutrous on—a tough game since Boutrous was just quoting the IPCC. It’s possible, then, to infer that Alsup was doing more than just getting up to speed on climate change on Wednesday. The physics and chemistry are quite literally textbook, and throughout the presentations he often seemed to know more than he was letting on. He challenged chart after chart incisively, and often cut in on history. When Allen brought up Roger Revelle’s work showing that oceans couldn’t absorb carbon—at least, not fast enough to stave off climate change, Alsup interrupted. “Is it true that Revelle initially thought the ocean would absorb all the excess, and that he came to this buffer theory a little later?” Alsup asked. “You may know more of this history than I do,” Allen said. But on the other hand, some of what the litigators seemed to not know sent the scientists in the back in literal spasms. When Boutrous couldn’t answer Alsup’s questions about the specific causes of early 20th-century warming (presumably before the big industrial buildup of the 1950s), Allen and Wuebbles, sitting just outside the gallery, clenched fists and looked like they were having to keep from shouting out the answer. Later, Alsup acknowledged that he’d watched An Inconvenient Truth to prepare, and Boutrous said he had, too. All of which makes it hard to tell whether bringing scientists to this table was the right move. 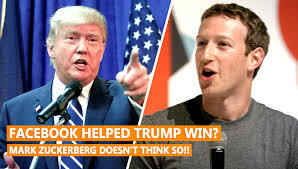 And maybe that has been the problem all along. The interface where utterly flexible law and policy moves against the more rigid statistical uncertainties of scientific observation has always been contested space. The practitioners of both arts seem foreign to each other; the cultural mores differ. Call Me a Carbon Polluter? See You in Court. Philly Under Water? Not so Fast.